Judgment and Decision Making, vol. 2, no. 2, April 2007, pp. 79-95. Most people are caring and will exert great effort to rescue individual victims whose needy plight comes to their attention. These same good people, however, often become numbly indifferent to the plight of individuals who are "one of many" in a much greater problem. Why does this occur? The answer to this question will help us answer a related question that is the topic of this paper: Why, over the past century, have good people repeatedly ignored mass murder and genocide? Every episode of mass murder is unique and raises unique obstacles to intervention. But the repetitiveness of such atrocities, ignored by powerful people and nations, and by the general public, calls for explanations that may reflect some fundamental deficiency in our humanity - a deficiency that, once identified, might possibly be overcome. One fundamental mechanism that may play a role in many, if not all, episodes of mass-murder neglect involves the capacity to experience affect, the positive and negative feelings that combine with reasoned analysis to guide our judgments, decisions, and actions. I shall draw from psychological research to show how the statistics of mass murder or genocide, no matter how large the numbers, fail to convey the true meaning of such atrocities. The reported numbers of deaths represent dry statistics, "human beings with the tears dried off," that fail to spark emotion or feeling and thus fail to motivate action. Recognizing that we cannot rely only upon our moral feelings to motivate proper action against genocide, we must look to moral argument and international law. The 1948 Genocide Convention was supposed to meet this need, but it has not been effective. It is time to examine this failure in light of the psychological deficiencies described here and design legal and institutional mechanisms that will enforce proper response to genocide and other forms of mass murder. Keywords: genocide; psychic numbing; dual process theories, affect, compassion. To avoid further disasters, we need political restraint on a world scale. But politics is not the whole story. We have experienced the results of technology in the service of the destructive side of human psychology. Something needs to be done about this fatal combination. The means for expressing cruelty and carrying out mass killing have been fully developed. It is too late to stop the technology. It is to the psychology that we should now turn. My title is taken from a statement by Mother Teresa: "If I look at the mass I will never act. If I look at the one, I will." These two observations capture a powerful and deeply unsettling insight into human nature. Most people are caring and will exert great effort to rescue "the one" whose needy plight comes to their attention. These same good people, however, often become numbly indifferent to the plight of "the one" who is "one of many" in a much greater problem. Why does this occur? The answer to this question will help us answer a related question: Why do good people ignore mass murder and genocide? For sixty plus years, since the liberation of the Nazi death camps, we've said "never again." Since then we've had mass exterminations of human beings, whether by deliberate malice or sheer, bloody-minded ideological stupidity, in China, Cambodia, Nigeria, Ethiopia, Kosovo, and Rwanda. Each time we tut tut, but ... we do nothing. "Never again" has become "again and again." And now there's Darfur, a region of Sudan, where the Janjaweed gangs, with the support of the corrupt national government, are carrying out yet another genocide. In a few years there'll be an HBO movie on Darfur. We'll vow "never again," once again, but the world being as it is, there will be another genocide under way even as we engage in the ritual of mild self-flagellation for Darfur. Why do we ignore mass murder and genocide? There is no simple answer. It is not because we are insensitive to the suffering of our fellow human beings - witness the extraordinary efforts we expend to rescue someone in distress. It is not because we only care about identifiable victims, of similar skin color, who live near us: witness the outpouring of aid to victims of the December 2004 tsunami in South Asia. We cannot simply blame our political leaders. Although President Bush has been quite unresponsive to the murder of hundreds of thousands of people in Darfur, it was Clinton who ignored Rwanda, and Roosevelt who did little to stop the Holocaust. Behind every president who ignored mass murder were millions of citizens whose indifference allowed them to get away with it. It's not fear of losing American lives in battle that necessarily deters us from acting. We have not even taken quite safe steps that could save many lives, such as bombing the radio stations in Rwanda that were coordinating the slaughter by machete of 800,000 people in 100 days, or supporting the forces of the African Union in Darfur, or just raising our powerful American voices in a threatening shout - Stop that killing! - as opposed to turning away in silence. Every episode of mass murder is unique and raises unique social, economic, military, and political obstacles to intervention. But the repetitiveness of such atrocities, ignored by powerful people and nations, and by the general public, calls for explanations that may reflect some fundamental deficiency in our humanity - a deficiency that, once identified, might possibly be overcome. This paper examines one fundamental mechanism that may play a role in many, if not all, episodes of mass-murder neglect. This mechanism involves the capacity to experience affect, the positive and negative feelings that combine with reasoned analysis to guide our judgments, decisions, and actions. Many researchers have begun to study the "dance of affect and reason" as it applies to decision making. I shall draw from this research to show how the statistics of mass murder or genocide, no matter how large the numbers, fail to convey the true meaning of such atrocities. The numbers fail to spark emotion or feeling and thus fail to motivate action. 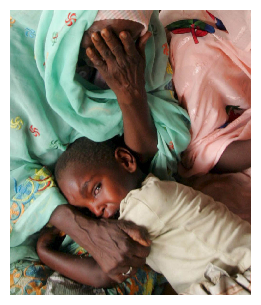 Genocide in Darfur is real, but we do not "feel" that reality. I shall conclude with suggestions about how we might make genocide "feel real" and motivate appropriate interventions. I shall also argue that we cannot only depend on our feelings about these atrocities but, in addition, we must create and commit ourselves to institutional and political responses based upon reasoned analysis of our moral obligations to stop the mass annihilation of innocent people. Although I have attempted to fashion a compelling explanation for genocide neglect that has implications for action, the story is not complete. The psychological account, while based on theory and recent empirical studies, clearly needs further testing and development, particularly to examine more directly the relationship between imagery, affect, and sensitivity to numbers. The action implications remain to be elaborated by legal scholars and others. On April 28, 1994: the Associated Press (AP) bureau in Nairobi received a frantic call from a man in Kigali who described horrific scenes of concerted slaughter that had been unfolding in the Rwandan capital "every day, everywhere" for three weeks. "I saw people hacked to death, even babies, month-old babies.... Anybody who tried to flee was killed in the streets, and people who were hiding were found and massacred." The caller's story was dispatched on the AP newswire for the planet to read, and complemented an OXFAM statement from the same day declaring that the slaughter - the toll of which had already reached 200,000 - 'amounts to genocide.' The following day, UN Secretary General Boutros Boutros-Ghali acknowledged the massacres and requested that the Security Council deploy a significant force, a week after the council had reduced the number of UN peacekeepers in Rwanda from 2,500 to 270. Yet the killings continued for another two and a half months. By mid-July, when the government was finally routed by exiled Tutsi rebels, the slaughter had been quelled, and 800,000 were dead, reinforcements from the United Nations were only just arriving. Despite its morally unambiguous heinousness, despite overwhelming evidence of its occurrence (for example, two days into the Rwandan carnage, the US Defense Intelligence Agency possessed satellite photos showing sprawling massacre sites), and despite the relative ease with which it could have been abated (the UN commander in Rwanda felt a modest 5,500 reinforcements, had they arrived promptly, could have saved tens of thousands of lives) - despite all this, the world ignored genocide. Unfortunately, Rwanda is not an isolated incident of indifference to mass murder and genocide. In a deeply disturbing book titled A Problem from Hell: America and the Age of Genocide, journalist Samantha Power documents in meticulous detail many of the numerous genocides that occurred during the past century, beginning with the slaughter of two million Armenians by the Turks in 1915 (Power, 2003, see Table 1). In every instance, American response was inadequate. She concludes, "No U.S. president has ever made genocide prevention a priority, and no U.S. president has ever suffered politically for his indifference to its occurrence. It is thus no coincidence that genocide rages on" (Power, 2003; p. xxi). Table 1. A century of genocide. A second lesson to emerge from the study of genocide is that media news coverage is similarly inadequate. The past century has witnessed a remarkable transformation in the ability of the news media to learn about, and report on, world events. The vivid, dramatic coverage of the December 2004 Tsunami in South Asia and the similarly intimate and exhaustive reporting of the destruction of lives and property by Hurricane Katrina in September 2005 demonstrate how thorough and how powerful news coverage of humanitarian disasters can be. 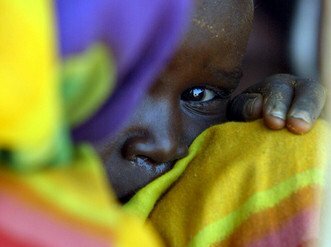 But the intense coverage of recent natural disasters stands in sharp contrast to the lack of reporting on the ongoing genocides in Darfur and other regions in Africa, in which hundreds of thousands of people have been murdered and millions forced to flee their burning villages and relocate in refugee camps. According to the Tyndall Report, which monitors American television coverage, ABC news allotted a total of 18 minutes on the Darfur genocide in its nightly newscasts in 2004, NBC had only five minutes, and CBS only three minutes. Martha Stewart and Michael Jackson received vastly greater coverage, as did Natalee Holloway, the American girl missing in Aruba. With the exception of the relentless reporting by New York Times columnist Nicholas Kristof, the print media have done little better in covering Darfur. I shall argue below that the disengagement exemplified by failing to "wrap our minds" around genocide and retreating to the "twilight between knowing and not knowing" is at the heart of our failure to act against genocide. Samantha Power's insightful explanation is supported by the research literature in cognitive and social psychology, as described in the sections to follow. In 1994, Roméo Dallaire, the commander of the tiny U.N. peacekeeping mission in Rwanda, was forced to watch helplessly as the slaughter he had foreseen and warned about began to unfold. Writing of this massive humanitarian disaster a decade later he encouraged scholars "to study this human tragedy and to contribute to our growing understanding of the genocide. If we do not understand what happened, how will we ever ensure it does not happen again?" Dallaire (2005, p.548). Researchers in psychology, economics, and a multidisciplinary field called behavioral decision theory have developed theories and findings that, in part, begin to explain the pervasive neglect of genocide. My search to identify a fundamental deficiency in human psychology that causes us to ignore mass murder and genocide has led to a theoretical framework that describes the importance of emotions and feelings in guiding decision making and behavior. Perhaps the most basic form of feeling is affect, the sense (not necessarily conscious) that something is good or bad. Affective responses occur rapidly and automatically - note how quickly you sense the feelings associated with the word "treasure" or the word "hate." A large research literature in psychology documents the importance of affect in conveying meaning upon information and motivating behavior (Barrett & Salovey, 2002; Clark & Fiske, 1982; Forgas, 2000; Le Doux, 1996; Mowrer, 1960; Tomkins, 1962, 1963; Zajonc, 1980). Without affect, information lacks meaning and won't be used in judgment and decision making (Loewenstein, Weber, Hsee, & Welch, 2001; Slovic, Finucane, Peters, & MacGregor, 2002). Affect plays a central role in what have come to be known as "dual-process theories" of thinking. As Seymour Epstein (1994) has observed: "There is no dearth of evidence in every day life that people apprehend reality in two fundamentally different ways, one variously labeled intuitive, automatic, natural, non-verbal, narrative, and experiential, and the other analytical, deliberative, verbal, and rational" (p. 710). Underlying the role of affect in the experiential system is the importance of images, to which positive or negative feelings become attached. Images in this system include not only visual images, important as these may be, but words, sounds, smells, memories, and products of our imagination. In his Nobel Prize Address, Daniel Kahneman notes that the operating characteristics of System 1 are similar to those of human perceptual processes (Kahneman, 2003). He points out that one of the functions of System 2 is to monitor the quality of the intuitive impressions formed by System 1. Kahneman and Frederick (2002) suggest that this monitoring is typically rather lax and allows many intuitive judgments to be expressed in behavior, including some that are erroneous. This point has important implications that will be discussed later. In addition to positive and negative affect, more nuanced feelings such as empathy, sympathy, compassion, sadness, pity, and distress have been found to be critical for motivating people to help others (Coke, Batson, & McDavis, 1978; Eisenberg & Miller, 1987). As Batson (1990, p. 339) put it, "... considerable research suggests that we are more likely to help someone in need when we `feel for' that person ..."
Table 2. Two modes of thinking: Comparison of experiential and analytic systems (adapted from Epstein, 1994, Copyright 1991, with permission from Guilford). One last important psychological element in this story is attention. Just as feelings are necessary for motivating helping, attention is necessary for feelings. Research shows that attention magnifies emotional responses to stimuli that are already emotionally charged (Fenske & Raymond, 2006; Villeumier, Armony, & Dolan, 2003). The psychological story can be summarized by the diagram in Figure 1. Research to be described in this paper demonstrates that imagery and feeling are lacking when large losses of life are represented simply as numbers or statistics. Other research shows that attention is greater for individuals and loses focus and intensity when targeted at groups of people (Hamilton & Sherman, 1996; Susskind, Maurer, Thakkar, Hamilton, & Sherman, 1999). The foibles of imagery and attention impact feelings in a manner that can help explain apathy toward genocide. ... moral intuition can be defined as the sudden appearance in consciousness of a moral judgment, including an affective valence (good-bad, like-dislike) without any conscious awareness of having gone through steps of searching, weighing evidence, or inferring a conclusion. Moral intuition is therefore ... akin to aesthetic judgment. One sees or hears about a social event and one instantly feels approval or disapproval. Figure 1: Imagery and attention produce feelings that motivate helping behavior. How should we value the saving of human lives? 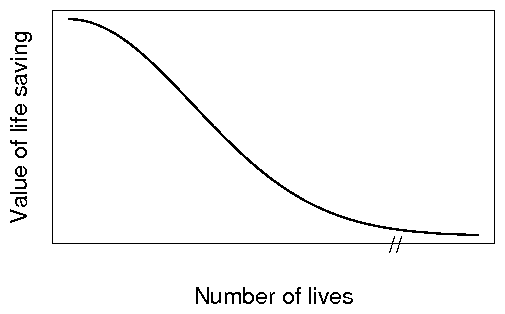 If we believe that every human life is of equal value (a view likely endorsed by System 2 thinking), the value of saving N lives is N times the value of saving one life, as represented by the linear function in Figure 2. Figure 2: A normative model for valuing the saving of human lives. Every human life is of equal value. Figure 3: Another normative model: Large losses threaten the viability of the group or society (as with genocide). An argument can also be made for a model in which large losses of life are disproportionately more serious because they threaten the social fabric and viability of a community as depicted in Figure 3. How do we actually value humans lives? I shall present evidence in support of two descriptive models linked to affect and System 1 thinking that reflect values for lifesaving profoundly different from the normative models shown in Figures 1 and 2. Both of these models are instructive with regard to apathy toward genocide. Fundamental qualities of human behavior are, of course, recognized by others besides scientists. American writer Annie Dillard, cleverly demonstrates the limitation of our affective system as she seeks to help us understand the humanity of the Chinese nation: "There are 1,198,500,000 people alive now in China. To get a feel for what this means, simply take yourself - in all your singularity, importance, complexity, and love - and multiply by 1,198,500,000. See? Nothing to it" (Dillard, 1999, p. 47, italics added). We quickly recognize that Dillard is joking when she asserts "nothing to it." We know, as she does, that we are incapable of feeling the humanity behind the number 1,198,500,000. The circuitry in our brain is not up to this task. This same incapacity is echoed by Nobel prize winning biochemist Albert Szent Gyorgi as he struggles to comprehend the possible consequences of nuclear war: "I am deeply moved if I see one man suffering and would risk my life for him. Then I talk impersonally about the possible pulverization of our big cities, with a hundred million dead. I am unable to multiply one man's suffering by a hundred million." There is considerable evidence that our affective responses and the resulting value we place on saving human lives may follow the same sort of "psychophysical function" that characterizes our diminished sensitivity to a wide range of perceptual and cognitive entities - brightness, loudness, heaviness, and money - as their underlying magnitudes increase. What psychological principles lie behind this insensitivity? In the 19 century, E. H. Weber and Gustav Fechner discovered a fundamental psychophysical principle that describes how we perceive changes in our environment. They found that people's ability to detect changes in a physical stimulus rapidly decreases as the magnitude of the stimulus increases (Weber, 1834; Fechner, 1860). What is known today as "Weber's law" states that in order for a change in a stimulus to become just noticeable, a fixed percentage must be added. Thus, perceived difference is a relative matter. To a small stimulus, only a small amount must be added to be noticeable. To a large stimulus, a large amount must be added. Fechner proposed a logarithmic law to model this nonlinear growth of sensation. Numerous empirical studies by S. S. Stevens (1975) have demonstrated that the growth of sensory magnitude (y) is best fit by a power function of the stimulus magnitude F, y = Fb, where the exponent b is typically less than one for measurements of phenomena such as loudness, brightness, and even the value of money (Galanter, 1962). For example, if the exponent is 0.5 as it is in some studies of perceived brightness, a light that is four times the intensity of another light will be judged only twice as bright. Figure 4: A psychophysical model describing how the saving of human lives may actually be valued. Our cognitive and perceptual systems seem to be designed to sensitize us to small changes in our environment, possibly at the expense of making us less able to detect and respond to large changes. As the psychophysical research indicates, constant increases in the magnitude of a stimulus typically evoke smaller and smaller changes in response. 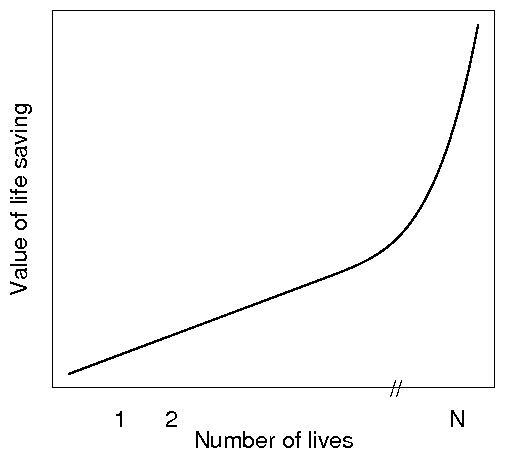 Applying this principle to the valuing of human life suggests that a form of psychophysical numbing may result from our inability to appreciate losses of life as they become larger (see Figure 4). 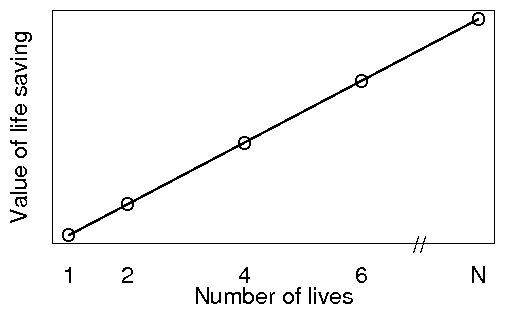 The function in Figure 4 represents a value structure in which the importance of saving one life is great when it is the first, or only, life saved, but diminishes marginally as the total number of lives saved increases. Thus, psychologically, the importance of saving one life is diminished against the background of a larger threat - we will likely not "feel" much different, nor value the difference, between saving 87 lives and saving 88, if these prospects are presented to us separately. Kahneman and Tversky (1979) have incorporated this psychophysical principle of decreasing sensitivity into prospect theory, a descriptive account of decision making under uncertainty. A major element of prospect theory is the value function, which relates subjective value to actual gains or losses. 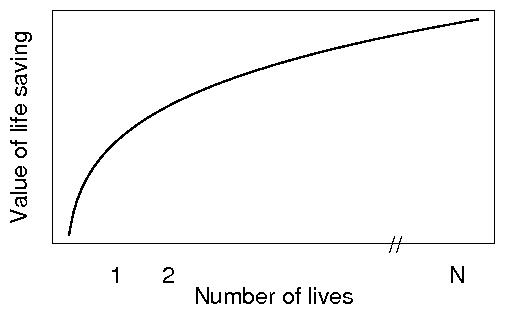 When applied to human lives, the value function implies that the subjective value of saving a specific number of lives is greater for a smaller tragedy than for a larger one. Fetherstonhaugh, Slovic, Johnson, and Friedrich (1997) documented this potential for diminished sensitivity to the value of life - i.e., "psychophysical numbing" - by evaluating people's willingness to fund various lifesaving medical treatments. In a study involving a hypothetical grant funding agency, respondents were asked to indicate the number of lives a medical research institute would have to save to merit receipt of a $10 million grant. Nearly two-thirds of the respondents raised their minimum benefit requirements to warrant funding when there was a larger at-risk population, with a median value of 9,000 lives needing to be saved when 15,000 were at risk, compared to a median of 100,000 lives needing to be saved out of 290,000 at risk. By implication, respondents saw saving 9,000 lives in the "smaller" population as more valuable than saving ten times as many lives in the largest. Several other studies in the domain of life-saving interventions have documented similar psychophysical numbing or proportional reasoning effects (Baron, 1997; Bartels & Burnett, 2006; Fetherstonhaugh et al., 1997; Friedrich et al., 1999; Jenni & Loewenstein, 1997; Ubel et al., 2001). For example, Fetherstonhaugh et al. (1997) also found that people were less willing to send aid that would save 1500 lives in Rwandan refugee camps as the size of the camps' at-risk population increased. Friedrich et al. (1999) found that people required more lives to be saved to justify mandatory antilock brakes on new cars when the alleged size of the at-risk pool (annual braking-related deaths) increased. These diverse strategies of lifesaving demonstrate that the proportion of lives saved often carries more weight than the number of lives saved when people evaluate interventions. Thus, extrapolating from Fetherstonhaugh et al., one would expect that, in separate evaluations, there would be more support for saving 80% of 100 lives at risk than for saving 20% of 1,000 lives at risk. This is consistent with an affective (System 1) account, in which the number of lives saved conveys little affect but the proportion saved carries much feeling: 80% is clearly "good" and 20% is "poor." Figure 5: Airport safety study: Saving a percentage of 150 lives receives higher support ratings than does saving 150 lives. Note. Bars describe mean responses to the question, "How much would you support the proposed measure to purchase the new equipment?" The response scale ranged from 0 (would not support at all) to 20 (very strong support; Slovic et al., 2002). 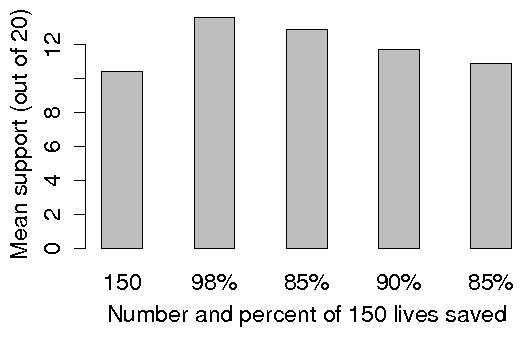 Slovic, Finucane, Peters, and MacGregor (2004), drawing upon the finding that proportions appear to convey more feeling than do numbers of lives, predicted (and found) that college students, in a between-groups design, would more strongly support an airport-safety measure expected to save 98% of 150 lives at risk than a measure expected to save 150 lives. Saving 150 lives is diffusely good, and therefore somewhat hard to evaluate, whereas saving 98% of something is clearly very good because it is so close to the upper bound on the percentage scale, and hence is highly weighted in the support judgment. Subsequent reduction of the percentage of 150 lives that would be saved to 95%, 90%, and 85% led to reduced support for the safety measure but each of these percentage conditions still garnered a higher mean level of support than did the Save 150 Lives Condition (Figure 5). This research on psychophysical numbing is important because it demonstrates that feelings necessary for motivating lifesaving actions are not congruent with the normative models in Figures 2 and 3. The nonlinearity displayed in Figure 4 is consistent with the disregard of incremental loss of life against a background of a large tragedy. However it does not fully explain the utter collapse of compassion represented by apathy toward genocide because it implies that the response to initial loss of life will be strong and maintained as the losses increase. Evidence for a second descriptive model, one better suited to explain the collapse of compassion, follows. Images seem to be the key to conveying affect and meaning, though some imagery is more powerful than others. After struggling to appreciate the mass of humanity in China, Annie Dillard turned her thoughts to April 30, 1991, when 138,000 people drowned in Bangladesh. At dinner, she mentions to her daughter - seven years old - that it is hard to imagine 138,000 people drowning. "No, it's easy," says her daughter. "Lots and lots of dots in blue water" (Dillard, 1999; p.131). Again we are confronted with impoverished meaning associated with large losses of life. Other images may be more effective. Organizers of a rally designed to get Congress to do something about 38,000 deaths a year from handguns piled 38,000 pairs of shoes in a mound in front of the Capitol (Associated Press, 1994). Students at a middle school in Tennessee, struggling to comprehend the magnitude of the holocaust, collected 6 million paper clips as a centerpiece for a memorial (Schroeder & Schroeder-Hildebrand, 2004). Probably the most important image to represent a human life is that of a single human face. Journalist Paul Neville writes about the need to probe beneath the statistics of joblessness, homelessness, mental illness, and poverty in his home state of Oregon, in order to discover the people behind the numbers - who they are, what they look like, how they sound, what they feel, what hopes and fears they harbor. He concludes: "I don't know when we became a nation of statistics. But I know that the path to becoming a nation - and a community - of people, is remembering the faces behind the numbers" (Neville, 2004). After September 11, 2001, many newspapers published biographical sketches of the victims, with photos, a dozen or so each day until all had been featured. Figure 6: The rescue of baby Jessica. Source: "The Baby Jessica Rescue Web Page," http://www.caver.net/j/jrescue.html, April 14, 2007. When it comes to eliciting compassion, the identified individual victim, with a face and a name, has no peer. Psychological experiments demonstrate this clearly but we all know it as well from personal experience and media coverage of heroic efforts to save individual lives. One of the most publicized events occurred when an 18-month-old child, Jessica McClure, fell 22 feet into a narrow abandoned well shaft. The world watched tensely as rescuers worked for 2 days to rescue her. 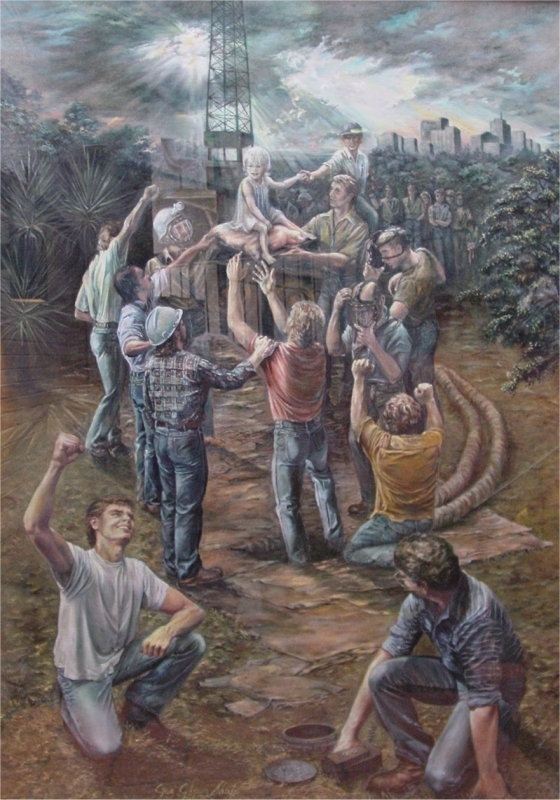 Almost two decades later, the joyous moment of Jessica's rescue is portrayed with resurrection-like overtones on a website devoted to pictures of the event (see Figure 6). But the face need not even be human to motivate powerful intervention. In 2001, an epidemic of foot and mouth disease raged throughout the United Kingdom. Millions of cattle were slaughtered to stop the spread. The disease waned and animal rights activists demanded an end to further killing. But the killings continued until a newspaper photo of a cute 12-day-old calf named Phoenix being targeted for slaughter led the government to change its policy. Individual canine lives are highly valued, too. A dog stranded aboard a tanker adrift in the Pacific was the subject of one of the most costly animal rescue efforts ever. An Associated Press article discloses that the cost of rescue attempts had already reached $48,000 and the Coast Guard was prepared to spend more, while critics charged that the money could be better spent on children that go to bed hungry (Song, 2002). In a bizarre incident that, nonetheless, demonstrates the special value of an individual life, an article in the BBC News online edition of November 19, 2005, reports the emotional response in the Netherlands to the shooting of a sparrow that trespassed onto the site of a domino competition and knocked over 23,000 tiles. A tribute website was set up and attracted tens of thousands of hits. The head of the Dutch Bird Protection Agency, appearing on television, said that though it was a very sad incident, it had been blown out of all proportion. "I just wish we could channel all this energy that went into one dead sparrow into saving the species," he said (BBC News, 2005). Although Kingsolver is describing the power of fiction, nonfiction narrative can be just as effective. The Diary of Anne Frank and Elie Weisel's Night certainly convey, in a powerful way, the meaning of the Holocaust statistic "six million dead." In Zambia, severe rainfall deficits have resulted in a 42% drop in maize production from 2000. As a result, an estimated 3 million Zambians face hunger. Four million Angolans - one third of the population - have been forced to flee their homes. 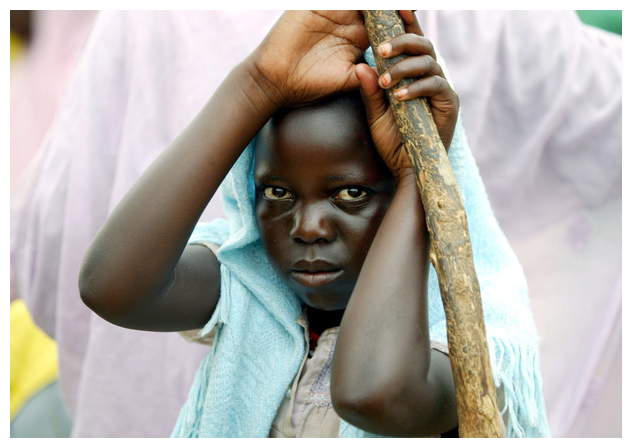 Rokia, a 7-year-old girl from Mali, Africa, is desperately poor and faces a threat of severe hunger or even starvation. Her life will be changed for the better as a result of your financial gift. With your support, and the support of other caring sponsors, Save the Children will work with Rokia's family and other members of the community to help feed her, provide her with education, as well as basic medical care and hygiene education. Vivid images of recent natural disasters in South Asia and the American Gulf Coast, and stories of individual victims, brought to us through relentless, courageous, and intimate news coverage, certainly unleashed a tidal wave of compassion and humanitarian aid from all over the world. Private donations to the victims of the December 2004 tsunami exceeded $1 billion. Charities such as Save the Children have long recognized that it is better to endow a donor with a single, named child to support than to ask for contributions to the bigger cause. Perhaps there is hope that vivid, personalized media coverage of genocide could motivate intervention. Figure 8: Mean donations. Reprinted from Small et al. (2007), Copyright (2007), with permission from Elsevier. Perhaps. But again we should look to research to assess these possibilities. Numerous experiments have demonstrated the "identifiable victim effect" which is also so evident outside the laboratory. People are much more willing to aid identified individuals than unidentified or statistical victims (Kogut & Ritov, 2005a; Schelling, 1968; Small & Loewenstein 2003, 2005; Jenni & Loewenstein, 1997). Small, Loewenstein, and Slovic (2007) gave people leaving a psychological experiment the opportunity to contribute up to $5 of their earnings to Save the Children. The study consisted of three separate conditions: (1) identifiable victim, (2) statistical victims, and (3) identifiable victim with statistical information. The information provided for the identifiable and statistical conditions is shown in Figure 7. Participants in each condition were told that "any money donated will go toward relieving the severe food crisis in Southern Africa and Ethiopia." The donations in fact went to Save the Children, but they were earmarked specifically for Rokia in Conditions 1 and 3 and not specifically earmarked in Condition 2. The average donations are presented in Figure 8. Donations in response to the identified individual, Rokia, were far greater than donations in response to the statistical portrayal of the food crisis. Most important, however, and most discouraging, was the fact that coupling the statistical realities with Rokia's story significantly reduced the contributions to Rokia. Alternatively, one could say that using Rokia's story to "put a face behind the statistical problem" did not do much to increase donations (the difference between the mean donations of $1.43 and $1.14 was not statistically reliable). Small et al. 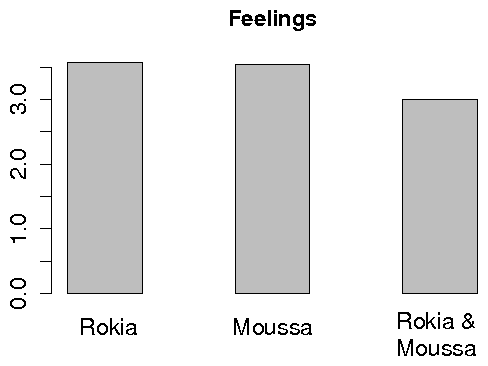 also measured feelings of sympathy toward the cause (Rokia or the statistical victims). These feelings were most strongly correlated with donations when people faced an identifiable victim. A follow-up experiment by Small et al. provided additional evidence for the importance of feelings. Before being given an opportunity to donate study participants were either primed to feel ("Describe your feelings when you hear the word `baby,"' and similar items) or to answer five questions such as "If an object travels at five feet per minute, then by your calculations how many feet will it travel in 360 seconds?" Priming analytic thinking (calculation) reduced donations to the identifiable victim (Rokia) relative to the feeling-based thinking prime. Yet the two primes had no distinct effect on statistical victims, which is symptomatic of the difficulty in generating feelings for such victims. Annie Dillard reads in her newspaper the headline "Head Spinning Numbers Cause Mind to Go Slack." She struggles to think straight about the great losses that the world ignores: "More than two million children die a year from diarrhea and eight hundred thousand from measles. Do we blink? Stalin starved seven million Ukrainians in one year, Pol Pot killed two million Cambodians ...." She writes of "compassion fatigue" and asks, "At what number do other individuals blur for me?" (Dillard, 1999, pp. 130-131). An answer to Dillard's question is beginning to emerge from behavioral research. Studies by Hamilton and Sherman (1996) and Susskind et al. (1999) find that a single individual, unlike a group, is viewed as a psychologically coherent unit. This leads to more extensive processing of information and clearer impressions about individuals than about groups. Kogut and Ritov (2005b) hypothesized that the processing of information related to a single victim might be fundamentally different from the processing of information concerning a group of victims. They predicted that people will tend to feel more distress and compassion when considering an identified single victim than when considering a group of victims, even if identified, resulting in a greater willingness to help the identified individual victim. Kogut and Ritov (2005a, b) tested their predictions in a series of studies in which participants were asked to contribute to a costly life-saving treatment needed by a sick child or a group of eight sick children. The target amount needed to save the child (children) was the same in both conditions, 1.5 million Israeli Shekels (about $300,000). All contributions were actually given to an organization that helps children with cancer. In addition to deciding whether or how much they wanted to contribute, participants in some studies rated their feelings of distress (feeling worried, upset, and sad) towards the sick child (children). Figure 9: Mean contributions to individuals and their group (from Kogut & Ritov, 2005b, Copyright 2005, with permission from Elsevier). The mean contributions to the group of eight and to the individuals taken from the group are shown in Figure 9 for one of the studies by Kogut & Ritov (2005b). Contributions to the individuals in the group, as individuals, were far greater than were contributions to the entire group. In a separate study, ratings of distress (not shown in the figure) were also higher in the individual condition. But could the results in Figure 9 be explained by the possibility that donors believed that families in the group condition would have an easier time obtaining the needed money which, in fact, was less per child in that condition? Further testing ruled out this explanation. For example, Kogut and Ritov asked people to choose between donating to a single child of the eight or donating to the remaining seven children. Many more (69%) chose to donate to the group, demonstrating a sensitivity to the number of victims in need that was not evident in the noncomparative evaluations. Kogut and Ritov concluded that the greater donations to the single victim most likely stem from the stronger emotions evoked by such victims in conditions where donors evaluated only a single child or only the group. Recall Samantha Power's assertion that those who know about genocide somehow "fail to wrap their minds around it." Perhaps this is a layperson's terminology for the less coherent processing of information about groups observed by Hamilton and Sherman (1966) and Susskind et al. (1999). And perhaps the beginning of this failure is evident with as few as eight victims. Figure 10: Mean affect ratings (left) and mean donations (right) for individuals and their combination (from Västfjäll, Peters, and Slovic, in preparation). Or, perhaps the deterioration of compassion may appear in groups as small as two persons! A recent study suggests this. Västfjäll, Peters, and Slovic (in preparation) decided to test whether the effect found by Kogut and Ritov would occur as well for donations to two starving children. Following the protocol designed by Small et al. (2007), they gave one group of Swedish students the opportunity to contribute their earnings from another experiment to Save the Children to aid Rokia, whose plight was described as in Figure 7. A second group was offered the opportunity to contribute their earnings to Save the Children to aid Moussa, a seven-year-old boy from Mali (photograph provided) who was similarly described as in need of food aid. A third group was shown the vignettes and photos of Rokia and Moussa and was told that any donation would go to both of them, Rokia and Moussa. The donations were real and were sent to Save the Children. Participants also rated their feelings about donating on a 1 (negative) to 5 (positive) scale. Affect was found to be least positive in the combined condition and donations were smaller in that condition (see Figure 10). 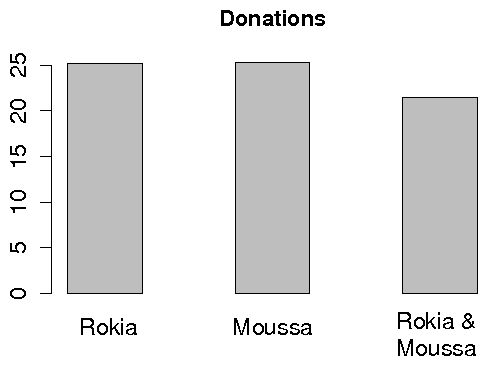 In the individual-child conditions, the size of the donation made was strongly correlated with rated feelings (r = .52 for Rokia; r = .52 for Moussa). However this correlation was much reduced (r = .19) in the combined condition. Figure 11: A model depicting psychic numbing - the collapse of compassion - when valuing the saving of lives. As unsettling as is the valuation of life-saving portrayed by the psychophysical model in Figure 4, the studies just described suggest an even more disturbing psychological tendency. Our capacity to feel is limited. To the extent that valuation of life-saving depends on feelings driven by attention or imagery (recall Figure 1), it might follow the function shown in Figure 11, where the emotion or affective feeling is greatest at N = 1 but begins to decline at N = 2 and collapses at some higher value of N that becomes simply "a statistic." In other words, returning to Annie Dillard's worry about compassion fatigue, perhaps the "blurring" of individuals begins at two! Whereas Robert J. Lifton (1967) coined the term "psychic numbing" to describe the "turning off" of feeling that enabled rescue workers to function during the horrific aftermath of the Hiroshima bombing, Figure 11 depicts a form of numbing that is not beneficial. Rather, it leads to apathy and inaction, consistent with what is seen repeatedly in response to mass murder and genocide.
" . . . engaging in guesswork for a cause. They say they are trying to count the deaths to shock the world into stopping the number from rising higher . . . " An American professor leading the accounting effort on behalf of the Coalition for International Justice argues that calculating the death toll is important to " . . . focus the attention of people . . . to give them some sense of the scale of what's happening in Darfur." Clearly there are political obstacles posing challenges to those who would consider intervention in genocide, and physical risks as well. What I have tried to describe in this paper are the formidable psychological obstacles centered around the difficulties in wrapping our minds around genocide and forming the emotional connections to its victims that are necessary to motivate us to overcome these other obstacles. Are we destined to stand numbly and do nothing as genocide rages on for another century? Can we overcome the psychological obstacles to action? There are no simple solutions. One possibility is to infuse System 1 with powerful affective imagery such as that associated with Katrina and the South Asian tsunami. This would require pressure on the media to do its job and report the slaughter of thousands of innocent people aggressively and vividly, as though it were real news. Nicholas Kristof, a columnist for the New York Times, has provided a model to emulate for his persistent and personalized reporting of the genocide in Darfur, but he is almost a lone voice in the mainstream American media. Another way to engage our experiential system would be to bring people from Darfur into our communities and our homes to tell their stories. But, as powerful as System 1 is, when infused with vivid experiential stimulation (witness the moral outrage triggered by the photos of abuse at the Abu Ghraib prison in Iraq), it has a darker side. We cannot rely on it. It depends upon attention and feelings that may be hard to arouse and sustain over time for large numbers of victims, not to speak of numbers as small as two. Left to its own devices, System 1 will likely favor individual victims and sensational stories that are closer to home and easier to imagine. It will be distracted by images that produce strong, though erroneous, feelings, like percentages as opposed to actual numbers. Our sizable capacity to care for others may also be overridden by more pressing personal interests. Compassion for others has been characterized by Batson, O'Quin, Fultz, Vanderplas, and Isen (1983) as "a fragile flower, easily crushed by self-concern" (p. 718). Faced with genocide, we cannot rely on our moral intuitions alone to guide us to act properly. A more promising path might be to force System 2 to play a stronger role, not just to provide us with reasons why genocide is wrong - these reasons are obvious and System 1 will appropriately sense their moral messages (Haidt, 2001). As Kahneman (2003) argues, one of the important functions of System 2 is to monitor the quality of mental operations and overt behaviors produced by System 1 (see also Gilbert, 2002 and Stanovich & West, 2002). Most directly, deliberate analysis of the sobering messages contained in this paper should make it clear that we need to create laws and institutions that will compel appropriate action when information about genocide becomes known. However, such precommitted response is not as easy as it might seem. Shortly after World War II, on December 9, 1948, the U. N. General Assembly drafted and adopted the Convention for the Prevention and Punishment of the Crime of Genocide. Hopes were high as the world's states committed themselves to "liberate mankind from such an odious scourge" as genocide (Convention preamble). Yet it took 40 years for the United States to ratify a watered-down version of this treaty, which has been honored mostly in its breach (Power, 2003; Schabas, 1999). Objections have centered around lack of clarity in the definition of genocide, including the numerical criteria necessary to trigger action. Some feared that the act would be used to target Americans unjustly. Senator William Proxmire took up the cause in 1967, making 3,211 speeches in support of ratification over a 19-year period. However, only Ronald Reagan's backing, to atone for his politically embarrassing visit to a cemetery in Germany where officials of the Nazi SS were buried, tipped the political balance toward ratification in 1988 of a weakened version of the Convention. When the United States had its first chance to use the law to stop the destruction of Iraq's rural Kurdish population, special interests, economic profit, and political concerns led the Reagan administration to side instead with the genocidal regime of Saddam Hussein (Power, 2003). Roméo Dallaire, in recounting the anguishing story of his failure to convince the United Nations to give him the mandate and force to stop the impending slaughter in Rwanda observes that, " . . .at its heart, the Rwandan story is the story of the failure of humanity to heed the call for help from an endangered people" (Dallaire, 2005, p. 516). The political causes of this and other such failures are rather well known. What I have tried to describe here are the psychological factors that allow politics to trump morality. Dallaire (2005) challenges his readers with several questions: "Are we all human, or are some more human than others? If we believe that all humans are human, then how are we going to prove it? It can only be proven through our actions" (p. 522). A final image: President George W. Bush stands by the casket of Rosa Parks in the rotunda of the U. S. Capitol, paying his respects. Why did the President and the nation so honor this woman? Because, by refusing to give up her seat on the bus she courageously asserted her humanity, answering Dallaire's questions by her actions. At almost the same time as the nation was honoring Parks, the U.S. Congress was stripping $50 million from the Foreign Operations Bill that was to help pay for African Union peacekeeping efforts in Darfur - another failure of the U.S. government to take meaningful action since September 2004 when Colin Powell returned from Sudan and labeled the atrocities there as "genocide." We appropriately honor the one, Rosa Parks, but by turning away from the crisis in Darfur we are, implicitly, placing almost no value on the lives of millions there. Associated Press. (1994, September 21). 38,000 shoes stand for loss in lethal year. The Register-Guard (Eugene, OR), p. 6A. Baron, J. (1997). Confusion of relative and absolute risk in valuation. Journal of Risk and Uncertainty, 14, 301-309. Barrett, L. F., & Salovey, P. (Eds.) (2002). The wisdom in feeling. New York: Guildford. Bartels, D. M., & Burnett, R. C. (2006). Proportion dominance and mental representation: Construal of resources affects sensitivity to relative risk reduction (Unpublished manuscript). Evanston, IL: Northwestern University. Bass, R. (1996). The book of Yaak. New York: Houghton Mifflin. Batson, C. D. (1990). How social an animal? The human capacity for caring. American Psychologist, 45, 336-346. Batson, C. D., O'Quin, K., Fultz, J., Vanderplas, M., & Isen, A. (1983). Self-reported distress and empathy and egoistic versus altruistic motivation for helping. Journal of Personality and Social Psychology, 45, 706-718. Clark, M. S., & Fiske, S. T. (Eds.) (1982). Affect and cognition. Hillsdale, NJ: Erlbaum. Coke, J. S., Batson, C. D., & McDavis, K. (1978). Empathic mediation of helping: A two-stage model. Journal of Personality and Social Psychology, 36, 752-766. Dallaire, R. (2005). Shake hands with the devil: The failure of humanity in Rwanda. New York: Carrol & Graf trade paperback edition. Dillard, A. (1999). For the time being. New York: Alfred A. Knopf. Dubinsky, Z. (2005). The lessons of genocide [Review of the book Conspiracy to murder: The Rwandan genocide]. Essex Human Rights Review, 2(1), 112-117. Eisenberg, N., & Miller, P. (1987). Empathy and prosocial behavior. Psychological Bulletin, 101, 91-119. Fenske, M. J., & Raymond, J. E. (2006). Affective influences of selective attention. Current Directions in Psychological Science, 15, 312-316. Forgas, J. P. (Ed.) (2000). Feeling and thinking: The role of affect in social cognition. Cambridge, UK: Cambridge University Press. Friedrich, J., Barnes, P., Chapin, K., Dawson, I., Garst, V., & Kerr, D. (1999). Psychophysical numbing: When lives are valued less as the lives at risk increase. Journal of Consumer Psychology, 8, 277-299. Galanter, E. (1962). The direct measurement of utility and subjective probability. American Journal of Psychology, 75, 208-220. Gilbert, D. T. (2002). Inferential correction. In T. Gilovich, D. fGriffin, & D. Kahneman (Eds. ), Heuristics and biases (pp. 167-184). New York: Cambridge University Press. Glover, J. (2001). Humanity: A moral history of the twentieth century. New Haven: Yale Nota Bene, Yale University Press. Hamilton, D. L. & Sherman, S. J. (1996). Perceiving persons and groups. Psychological Review, 103, 336-355. Jenni, K. E. & Loewenstein, G. (1997). Explaining the "Identifiable victim effect." Journal of Risk and Uncertainty, 14, 235-257. Kahneman, D. & Frederick, S. (2002). Representativeness revisited: Attribute substitution in intuitive judgment. In T. Gilovich, D. Griffin & D. Kahneman (Eds. ), Heuristics and biases (pp. 49-81). Cambridge: Cambridge University Press. Kingsolver, B.(1996). High tide in Tucson. New York: Harper Perennial Edition. Kogut, T. & Ritov, I. (2005a). 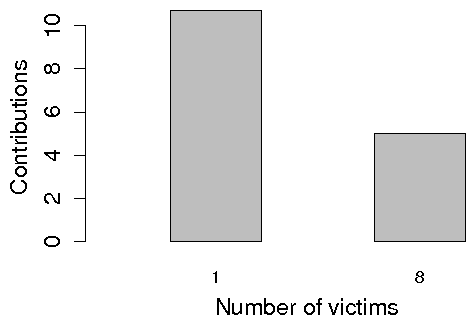 The "Identified Victim" effect: An identified group, or just a single individual? Journal of Behavioral Decision Making, 18, 157-167. Kogut, T., & Ritov, I. (2005b). The singularity of identified victims in separate and joint evaluations. Organizational Behavior and Human Decision Processes, 97, 106-116. Lacey, M. (2005, May 18). The mournful math of Darfur: The dead don't add up. The New York Times, p. A4. Le Doux, J. (1996). The emotional brain. New York: Simon & Schuster. Lifton, R. J. (1967). Death in life: Survivors of Hiroshima. New York: Random House. Loewenstein, G., Weber, E. U., Hsee, C. K., & Welch, E. S. (2001). Risk as feelings. Psychological Bulletin, 127, 267-286. Melvern, L. (2004). Conspiracy to murder: The Rwandan genocide. London: Verso. Mowrer, O. H. (1960). Learning theory and behavior. New York: John Wiley & Sons. Neville, P. (2004, February 15). 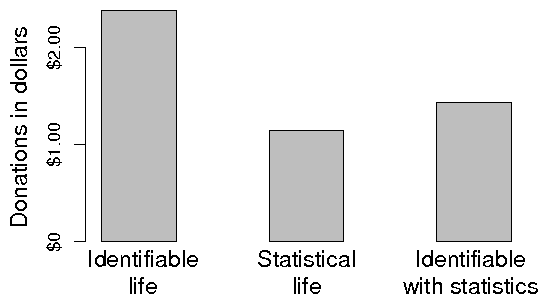 Statistics disguise a human face. The Register-Guard [Eugene, OR]. Power, S. (2003). A problem from hell: America and the age of genocide. New York: Harper Perennial. Reynolds, M. (2005, June 7). Center line. Retrieved December 29, 2005 from http://www.mightymiddle.com/index.php? Schelling, T. C. (1968). The life you save may be your own. In S. Chase (Ed.) Problems in public expenditure analysis. Washington DC: The Brookings Institute. Schroeder, P. & Schroeder-Hildebrand, D. (2004). Six million paper clips: The making of a children's holocaust museum. Minneapolis: Kar-Ben Publishing. Slovic, P., Finucane, M. L., Peters, E., & MacGregor, D. G. (2004). Risk as analysis and risk as feelings: Some thoughts about affect, reason, risk, and rationality. Risk Analysis, 24, 1-12. Slovic, S., & Slovic, P. (2004). Numbers and nerves: Toward an affective apprehension of environmental risk. Whole Terrain, 13, 14-18. Small, D. A. & Loewenstein, G. (2003). Helping a victim or helping the victim: Altruism and identifiability. Journal of Risk and Uncertainty, 26, 5-16. Small, D. A. & Loewenstein, G. (2005). The devil you know: The effects of identifiability on punitiveness. Journal of Behavioral Decision Making, 18, 311-318. Song, J. (2002, April 26). Every dog has its day - but at what price? The Register-Guard [Eugene, OR], p.1. Stanovich, K. E., & West, R. F. (2000). Individual differences in reasoning: Implications for the rationality debate? Behavioral and Brain Sciences, 23, 645-726. Stanovich, K. E., & West, R. F. (2002). Individual differences in reasoning: Implications for the rationality debate? In T. Gilovich, D. W. Griffin, & D. Kahneman (Eds. ), Heuristics and biases: The psychology of intuitive judgment (pp. 421-444). New York: Cambridge University Press. Susskind, J., Maurer, K., Thakkar, V., Hamilton, D. L. & Sherman, J. W. (1999). Perceiving individuals and groups: Expectancies, dispositional inferences, and causal attributions. Journal of Personality and Social Psychology, 76, 181-191. Ubel, P. A., Baron, J., & Asch, D. A. (2001). Preference for equity as a framing effect. Medical Decision Making, 21, 180-189. Västfjäll, D., Peters, E., & Slovic, P. (In preparation). Representation, affect, and willingness-to-donate to children in need. Unpublished manuscript. Villeumier, P., Armony, J. L., & Dolan, R. J. (2003). Reciprocal links between emotion and attention. In K. J. Friston, C. D. Frith, R. J. Dolan, C. Price, J. Ashburner, W. Penny, et al. (Eds. ), Human brain function (2nd ed., pp. 419-444). New York: Academic Press. Weber, E. H. (1834). De pulsu, resorptione, auditu et tactu. Leipzig: Koehler. 1I wish to thank the William and Flora Hewlett Foundation and its president, Paul Brest, for support and encouragement in the writing of this paper. Additional support was provided by the National Science Foundation through grant SES-0241313. Many individuals have provided constructive criticism and helpful suggestions on earlier drafts as well as other valuable intellectual and logistical support. A partial list includes Dan Ariely, Peter Ayton, Jon Baron, Jon Haidt, Derek Jinks, Tehila Kogut, George Loewenstein, Ruth Marom, Ellen Peters, Ilana Ritov, Nils Eric Sahlin, Peter Singer, Scott Slovic, Deborah Small, Ola Svenson, Daniel Västfjäll, Leisha Wharfield, and an anonymous reviewer. 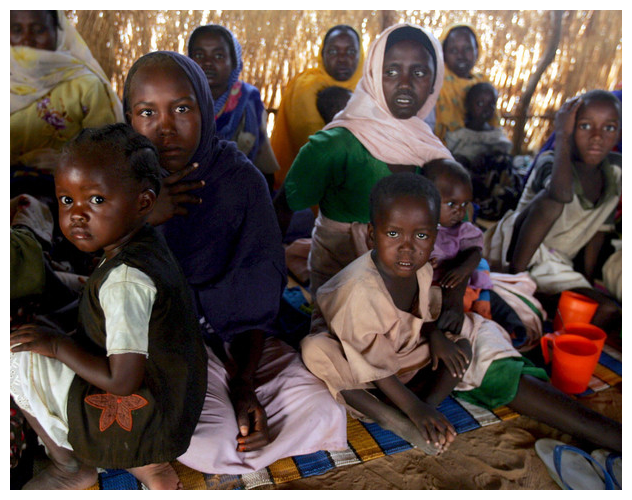 Photos from Darfur: Khaled El Fiqi/EPA/Corbis, reprinted with permission. 2A thoughtful reviewer of this paper questions my focus on preventing genocide. The reviewer asserts that numbers of preventable deaths from poverty, starvation, and disease are far larger than the numbers of people killed in Darfur. The psychological account presented here clearly has implications for motivating greater response to humanitarian crises other than genocide and certainly such implications should be pursued. I focus on genocide because it is a heinous practice, carried out by known human antagonists, that could in principle be stopped if only people cared to stop it. Apathy toward genocide and other forms of mass murder moves us closer to the loss of humanity. On 19 Apr 2007, 17:39.